We're back with a new edition of Keep It Real Friday. We're talking the electric performance of Pedro Martinez, (and ignoring that of A.J. Burnett), we're taking aim at the NCAA and their treatment of the college games most feared offensive player, finally we wrap up with some Boston Celtics/Cleveland Cavaliers combined with a tribute to coach Bobby Knight. I've got to Keep It Real, I just miss it Pedro. Last night was the first time since Pedro Martinez left Boston that I remembered how magical he was over seven seasons. When the cocky brash ace of the Boston Red Sox would take the mound at Fenway Park, nothing compared. A chill went through your bones when "Petey" would dazzle hitters with poise and guile, as I said before, nothing compared. However, now with the Phills and the Mets before that, something didn't seem the same when he wasn't wearing the jersey of your hometown Red Sox. The hop gone from your step and we've moved on from Pedro Martinez. That was until, that same cocky, brash right-hander we know and love returned to the Bronx. Excited all day, ignoring people who assumed Martinez would fall victim to the short fence in the NEW Bronx Zoo, I couldn't wait to watch this play out. He was back, if you didn't know before, you knew after he spoke to the New York media. Egging on Yankee fans every way possible, then he did what I so desperately wanted a 38-year old former Red Sox to do, pitch his a** off. Don't box score this one up folks, Pedro fanned eight over seven innings before exiting down 3-1. The Yankee fans jeered him with "Who's your daddy?" ringing out all evening, and while he was walking off the field for possibly his final time in New York, he lowered his brim and grinned from ear to ear: That was Pedro Martinez. I've got to Keep It Real, I miss that. Whomever is responsible for suspending Oklahoma State receiver, Dez Bryant, for the remainder of the '09 season is flat out foolish. Quickly for those of you who don't know, Bryant visited and worked out with former NFL player turned pseudo-mentor, Deion Sanders, which isn't against any NCAA rule. However, when questioned by the NCAA, Bryant, a college junior, didn't tell the truth about his interaction with Primetime. For not telling the truth, about an interaction he should never have been questioned about, Dez Bryant is on the sidelines for his junior season in Stillwater. The 6'2" wideout has 9 career games with over 100 yards receiving, 20+ career receiving TD's, and on pace to sew up his first Biletnikoff Award (giving to the nation's top receiver). Did I mention he was downright prolific in his first three games of this season? 17 catches for 323 yards and four touchdowns. That is a distant memory today. The NCAA has ruled to keep Bryant out and in doing so will most likely call it a wrap on the college career of the most NFL ready wideout since Calvin Johnson. The NCAA has robbed us all long enough, time to Keep It Real! During a season in which no college football player has clearly stated they are the Heisman Memorial Trophy recipient, Dez Bryant could have been. During a season which could have seen the Oklahoma State Cowboys become the 3rd team of the Big 12, they won't. We wanted to see Dez Bryant at the Downtown Athletic Club, and unfortunately we'll be seated alongside three men who clearly don't deserve it as much. NCAA, Keep It Real. NBA "Insider" continue to pick the Orlando Magic & Cleveland Cavaliers. I'll Keep It Real, and take those underdog 17-time World Champion Celtics. We get it, you desperately want to see Kobe v. LeBron in the NBA Finals, just come out and say it already. The truth is, you don't think it will happen and your trying to convince us otherwise. Allow me to break this down for you, let's look at overall talent. The Celtics are running out Kevin Garnett, Paul Pierce, Rajon Rondo, and Ray Allen. Off the bench, they break out specialty players like Eddie House, Marquis Daniels, Glen Davis, and oh yea, Rasheed F'n Wallace! Boston's answer in crunch time is Paul Pierce, and yes at 32-years old, he's still one of the games premier closers. I'm tired of hearing about Shaq, he's overweight and just NOT THAT GOOD anymore. That was what the Cavs thought would bring a ring to LeBron James? The first game of the season was the most telling time, the Cavaliers sat King James for a brief rest, and the Celtics took control of the game for good. By the time LeBron got going again, the rest of his team decided to sit around and watch him play basketball. The Celtics are very deep, have championship pedigree, and more importantly, they have better talent! Look up and down the Cavaliers roster, the only player you'd want on Boston is LeBron. Give it a rest with the Kobe v. LeBron, it didn't happen last year and it won't happen this year. Keep It Real, C's returning to The Finals! 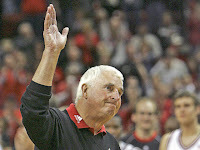 Bobby Knight is The General, no bones. Next week, the University of Indiana will induct seven distinguished people into their athletic hall of fame. One of those seven is the man who brought basketball championships to the school and in the process became one of the best college basketball coaches we've ever seen. However, he won't be at the induction into the hall of famer, his choice not theirs. Declining to attend the ceremony because it will "cause too much of a distraction to the other people being honored", and that my friend is what I've been saying for years. Okay, so maybe I haven't been talking about the University of Indiana's athletic hall of fame, but I have been saying special people deserve the stage to themselves. For instance, is it necessary to induct Michael Jordan the same weekend you induct Jerry Sloan, David Robinson, John Stockton, and C. Vivian Stringer into the basketball of hall of fame? Exactly what Knight is trying to avoid happened on that night, Jordan is the center of attention and he's who everyone came to see, which isn't fair for anyone else on the ticket. For years people say how awful Knight is, and any bad thing you can attack the guy for. Lay off him for this one, this is a true standup move and I applaud you. Keep It Real, The General is aces in my book! Southern California will lose in Eugene, Oregon on Saturday. Brett Favre will be upstaged by Aaron Rodgers on Sunday.